eBay has announced some drastic price changes. While the message is “fees are lower”, some fees are actually higher. It’s a mixed bag of changes with some good and some not so good. In this blog post, we will highlight the pertinent changes of the new fee structure and highlight the winners and losers. 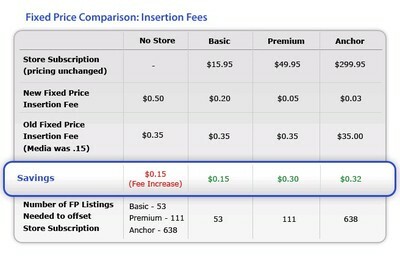 For an eBay Store seller who has over 53 listings, the Store subscription can pay for itself in reduced insertion fees. The trick is finding the right subscription. We’ve added the chart below to assist you in determining the best option. The downside is that other than the fees, there isn’t much of a difference between Store and Fixed Price listing. Store items will be treated the same as Fixed Price and other than a few Store features visible on listings; it’s not really a “Store”. Overall, eBay will end up with more subscriptions for Stores, and sellers can see reduced insertion fees. It’s bad news for the small, occasional seller who does not list at least 53 items per month as their costs have risen quite dramatically. 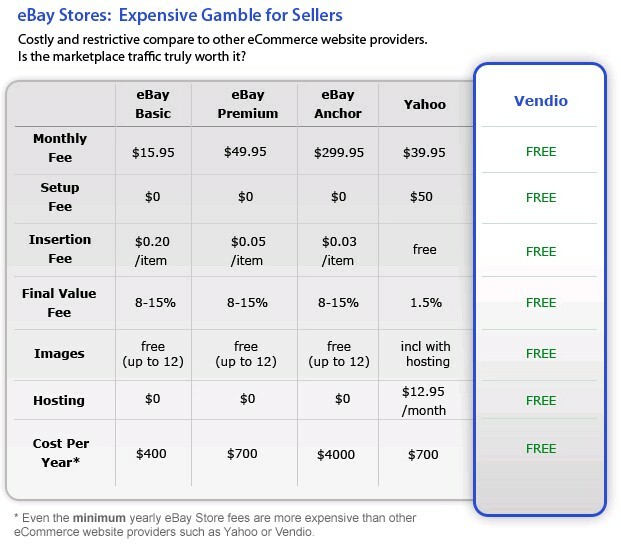 In addition, the concept of a “Store” has pretty much gone by the wayside and has really become a membership to get reduced prices versus providing a true eCommerce store such as those offered by Vendio (free) or Yahoo ($39.95 per month/plus 1.5% FVF). The ability to brand or promote any other non-eBay aspect of your business (e.g. separate online store) is very limited. Media sellers who used to pay 15% on the first $50.00 and 5% to $1,000 face a hefty increase on items over $50.00. For example, if I sell a media item for $150.00, my old price would be $12.50 (15% on the first $50, 5% on the next $100), the new price would be a flat 15% or $22.50 for an increase of $10.00. To be fair, many media sellers would not be affected as the prices typically are under $50.00 and they do have an extended special pricing available for a bit longer. For Auctions, this again is a mixed bag. Insertion fees are lower, but Final Value Fees are higher. A seller can save significantly on items that are higher priced. There is also the ability to list up to 100 free items if you start the price at $0.99 or less. This strategy was fine years ago, but due to an influx of “low start-price, high shipping price” listing strategies, the risks of being burned selling an expensive item for a low amount has increased significantly. Sellers should carefully weigh the risks before they adopt this strategy. This also seems contradictory toward eBay’s push to have seller’s offer free shipping as it is difficult to offer free shipping on $0.99 items. For Auction Final Value Fees, it’s a price increase. The second tier was increased from $25 to $50, thus you are paying the full shot on items under $50. 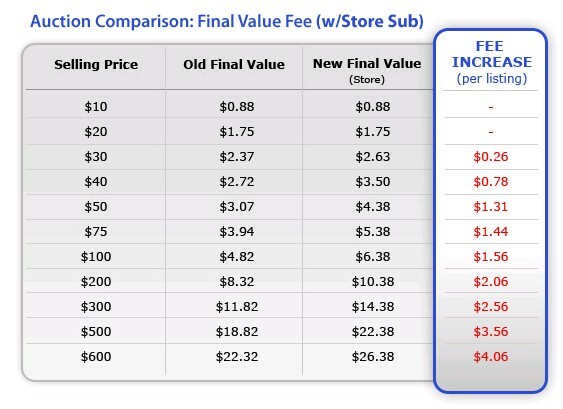 In the below charts, we looked at both the Standard and the Store subscription and in both cases fees were increased. There is a large discrepancy between what a casual seller pays and what a seller with a Store pays as you get into the higher ticket items. Barrier to entry is higher and the small casual seller is disadvantaged. In a nutshell, the changes are very sweeping and it will take some time for sellers to determine their best course of action. You can view all of the proposed changes, effective March 30, 2010 here. eBay has a fee calculator to help you figure out what works best for your business. Have questions? For it? Against it? Have tips or tactics to share? Drop a comment below. This entry was posted on Thursday, January 28th, 2010 at 12:41 pm	and is filed under eBay Marketplace. You can follow any responses to this entry through the RSS 2.0 feed. Both comments and pings are currently closed. This round of price hikes makes me wonder: Where is ebay going to find higher revenue after they’ve killed the golden goose and driven off most of their seller base? Surely the esteemed Bain crew has a plan that involves more than golden parachutes? Just to make sure every seller realizes (as I ahve not seen any articles or media platform point out yet): The 100 FREE AUCTION LISTINGS are not available to store owners. You only get the free listings if you are not a subscriber! There is no free anything to subscribers, and only increased fees, unless your core business model used auctions and fixed prices for a majority of your listings. Real APPLES TO APPLES comparison! You have missed the entire crux of the hypotenuse. The methodology employed is remarkably flawed. 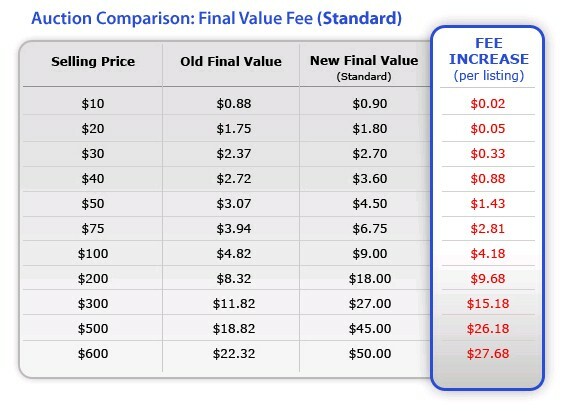 The chart compares OLD FIXED PRICE INSERTION FEES to NEW FIXED PRICE INSERTION FEES. This provides no value to an eBay Store seller. This only provides a cost comparison between current Fixed Price (core) listings and future Subscriprion Fixed Price (core) listings. That is useful, for such a party. However, the most important comparison is between current eBay Store Owners and future Subscriprion Fixed Price (core) sellers. Store owners are the parties being frog-marched down that path. Store owners are the parties most affected by the new fee changes. 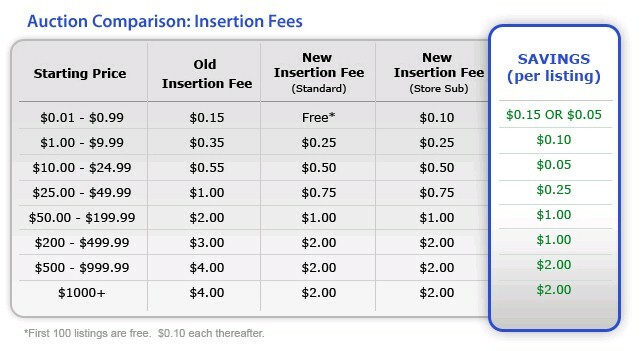 The fee comparison basis for those parties is between OLD STORE INSERTION FEES and NEW FIXED PRICE INSERTION FEES. If you have any faith at all in eBay’s phony feedback ratings you must believe in the tooth fairy. Just look at the number of 100% ratings given to so many vendors. It is simply impossible for any vendor to please every single one of thousands of customers. eBay makes it impossible to post negative ratings. I stopped using eBay several years ago as it is simply a scam.